Players of most massively multiplayer online role-playing games today usually aren�t faced with any great variety of missions that really impact your character or how you play. The most you�re faced with is what kind of reward you�ll get or, at most, which of the two factions you�ll support against the other. It doesn�t really have any effect on you in the grand scheme of things and you�ll probably forget about the whole thing in a month or so. Instead of that static, boring type of storytelling, we wanted to create a more immersive story with Tabula Rasa, one that the players could interact with, where their actions could have long reaching consequences. We call this form of story-telling interaction the ethical parable and it is one of the hallmarks of a Richard Garriott game. Ethical and moral dilemmas are something we definitely wanted to incorporate into the design of Tabula Rasa from the very start. The entire goal is to give you pause and allow you to think about the choices that they make in order to accomplish a mission. This way, at times, you will not be limited to one single path but may have multiple paths. We want you to think about the larger story and how your actions can affect this story down the road. Now you have the ability to play the game the way you want to play it. This in essence is the parable�a type of story that allows you to explore moral lessons or decisions. We won�t be throwing these ethical parables at the players in every mission, but we definitely want players to get a taste for them early on in the game. 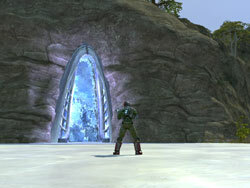 We�ve placed a few on, the first major landmass that players will encounter in Tabula Rasa. One of these early missions involves the delivery of pharmaceuticals to soldiers on the front lines. While the supply commander, a rather straight-laced and stand-up kind of individual, would rather these pharmaceuticals be distributed to the soldiers in a formal, organized system, there�s a man who stole a whole bunch and has been selling them to the soldiers for a nice profit. Your decision to either turn in the thief, or help him distribute the stolen goods, not only affects the mission outcome but determines how the NPC soldiers will interact with you from then on. Another mission of note is for players with levels in the mid-teens. 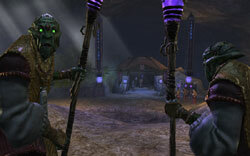 As you progress though the game and are redeployed to Foreas Base, you�re told that the AFS has a Bane prisoner who is currently undergoing interrogation. This will start a chain of missions as the Bane prisoner reveals more and more information, allowing you to attack the local Bane base, kill a key Bane soldier, deal with some traitors, and possibly even defend the prison from attack. 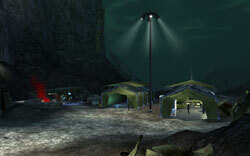 At the end of this mission chain, you�re now left with the choice of what to do with the prisoner. On one hand, he�s one of the evil Bane, who wiped out most of humanity and forced people like yourself to fight for survival on a few scattered alien worlds. It doesn�t deserve to live� or does it? As a mere soldier, the Bane was just doing what it was supposed to do, no more and no less, and cannot really be held responsible for what the leadership of the Bane did to Earth. What would be the harm in letting him live, and more importantly, what more could you learn from him? If you were a prisoner, wouldn�t you want to be treated humanely, instead of being executed for telling you what you wanted to know? These are a couple of examples of the parables we will present in Tabula Rasa. Some of them will have little or no long-term impact, and others may influence the way you experience the game. We want to give you the choice to play the game the way you want to, without hemming you into one specific path. This way, we�ve created a better, richer, more immersive game experience for you to enjoy. Posted on 07 November 2007 at 16:52:02 by Magi. Mmm i like it ! Posted on 21 February 2009 at 02:56:50 by Anonym. Dang, this turned out to be a load of nothing, eh?